Patchbox II is a “must have” for your gadget bag! It’s a “splitter” that can take the output of a mixer, and split it into 12 different outputs. It’s perfect for remotes, when you need to feed a mixer to a PA system, tape decks, studio link, telco coupler, etc. Patchbox II is passive; it needs no batteries or power. PatchBox IIis a passive “output multiplier” that can be used to distribute the output of a professional audio mixer to the inputs of peripheral equipment. 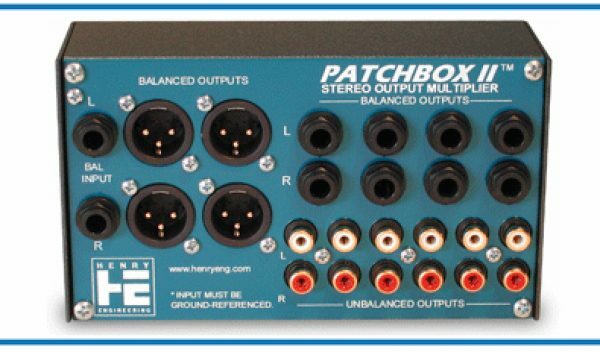 PatchBox II is ideal for feeding a mixerâs output signal into DAT recorders, digital editors, computer sound cards, cassette and reel decks, VCRs, PA systems, dubbing racks, limiters, and other audio equipment. Both professional equipment with balanced inputs and consumer equipment with unbalanced inputs can be used. 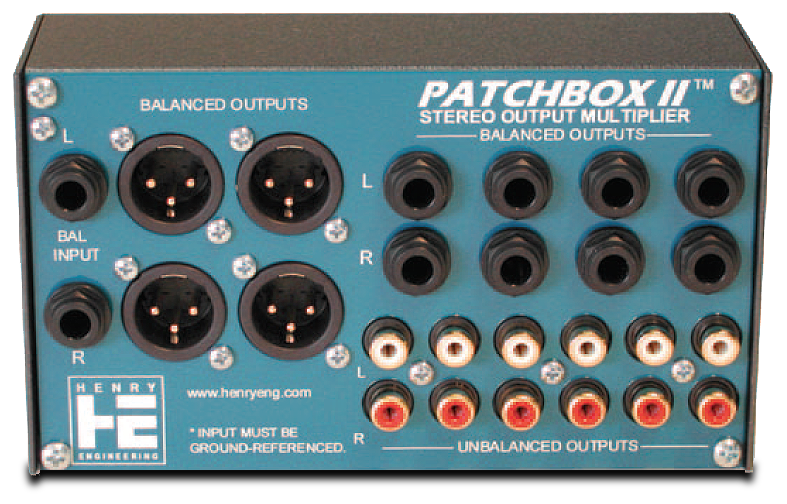 From a stereo source, PatchBox II creates twelve stereo outputs: six balanced stereo outputs and six unbalanced stereo outputs. PatchBox II balanced outputs, on XLR and ¼” TRS connectors, provide a “unity gain” signal with a 600 ohm source impedance. PatchBox II unbalanced outputs, on gold-plated RCA connectors, provide a signal that is compatible with the inputs of consumer gear. Because the inputs circuits of audio equipment are normally high-impedance (“bridging”), any combination of outputs can be used simultaneously without interaction or signal degradation.